As the name implies, HP Deskjet printers are printers designed to sit on your desk and offer you convenient, high quality printing results. HP Deskjet printers are HP's most affordable range of printers with some models coming as all-in-one multi-function printers. HP Deskjet series printers give you easy text and photo printing in a compact, reliable, and easy to use design. HP Deskjet printers are great for printing off high quality colour documents, photography and projects within the home or small office. Their smart, ergonomic and compact design gives you stylish looks which has efficient and multi-function printing capabilities combined into one device. HP Deskjet ink cartridges feature an inexpensive and disposable print head which is built into the cartridge design. 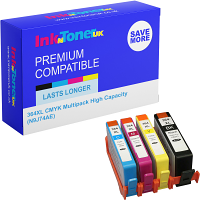 These HP ink cartridges allow for consistent quality over time which is affordable and easy to change over. HP ink cartridges for HP Deskjet printers are also easy to recycle and reuse, making them the environmental choice for the consumer of ink cartridges. Colour HP Deskjet ink cartridges use tri-colour technology which combines Cyan, Magenta and Yellow pigment inks into one single cartridge. The cartridge mixes these three primary colours together to create full colour printing from your HP Deskjet printer. 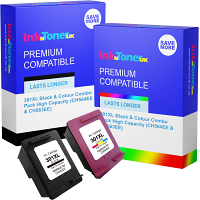 The benefits of this type of HP colour ink cartridge make it easy to replace and print with.